Return to current year’s Special Dinners page. 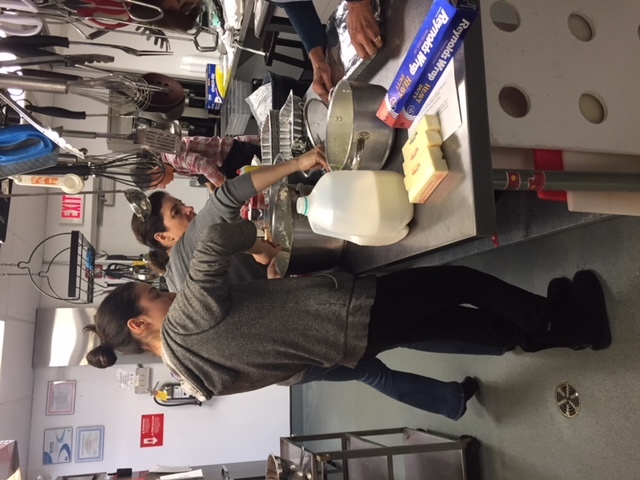 Again this year, on the Wednesday before Thanksgiving, T&E Care volunteers cooked Thanksgiving dinners for ten local families. These are folks who really struggle and we like to help them know that they can be thankful they live in T/E!! We have often received some of the most heartfelt thanks due to this program, so it really does touch home. Thanks to St. Luke Lutheran Church for hosting this event – what a wonderful partner on this project! Thanks to Cindy Gilroy, Danyll Lockett, and Laura Pratt for again working to coordinate this program. 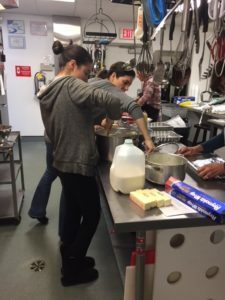 And special thanks to all those who donated food for the program – the results were amazing. 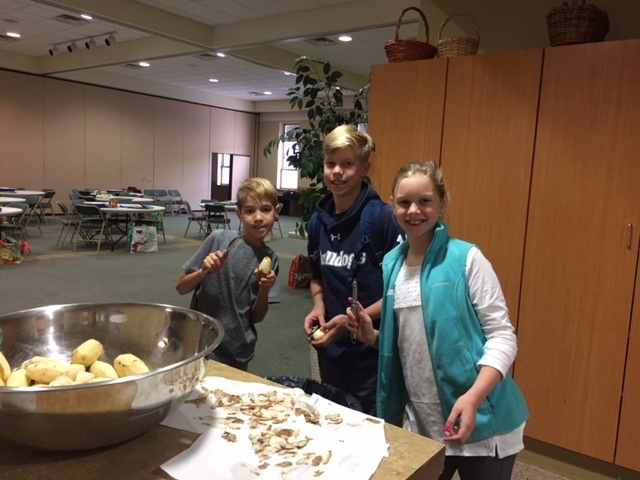 VERY special thanks once again to the Hayden family – who baked dozens of pumpkin cookies for the families, and to the Amana Foundation – for delivering bags and bags of fresh produce, for EACH family. Clearly they understand the value of neighbors helping neighbors. 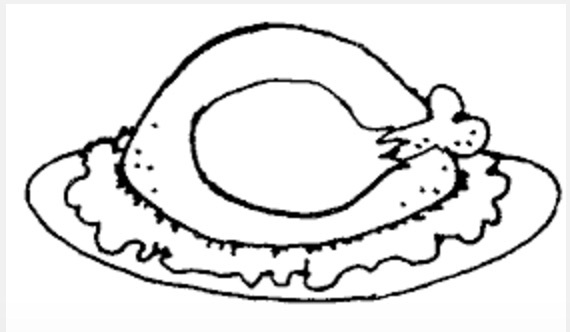 (See pictures below.) Please contact us at turkeys@tecare.org with questions. 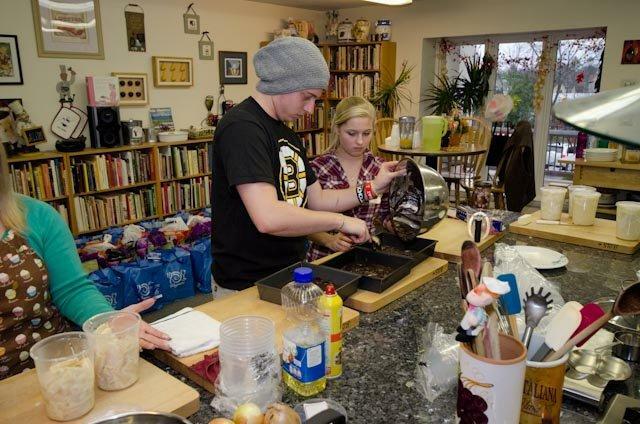 Just like at Thanksgiving time we supported ten local families with special dinners at the holidays. 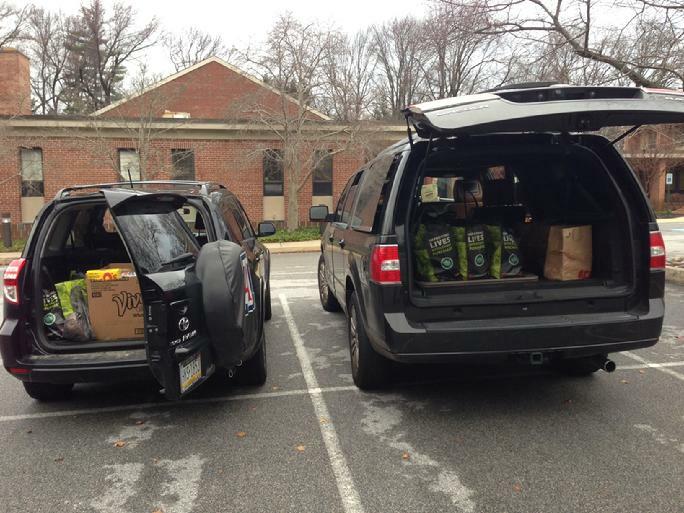 We collected the food on December 21 and 22 at St. Luke Church in Devon. LOTS of folks helped by providing the necessary food to make these dinners extra special. THANKS to Jen Bracco for coordinating the drive and to Laura Pratt for again working to determine the families being assisted! 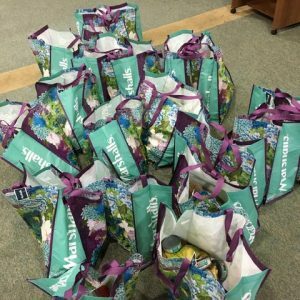 Extra special thanks to the folks at the Amana Foundation for once again providing bags and bags of fresh produce – the most important part of the dinner items! And of course, thanks again to St. Luke for opening its doors to this project for us! Contact us with any questions – holidaydinner@tecare.org. 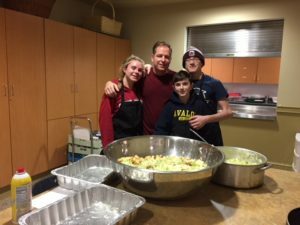 THANKSGIVING DINNER PICTURES – such generosity, such fun! 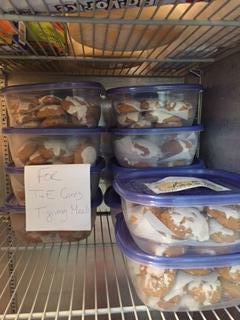 Again this year T&E Care volunteers prepared Thanksgiving dinners for 10 local families. 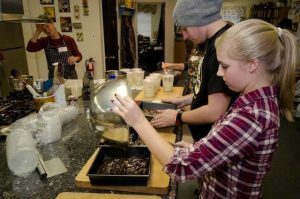 St. Luke Lutheran Church in Devon graciously offered their space to use for this preparation, which took place on Wednesday morning, November 23. Sign-ups for those items were found at SIGN UP GENIUS. Thanks to Cindy Gilroy, Danyll Lockett, and Laura Pratt for again working to coordinate this program. Please contact us at turkeys@tecare.org with questions. Our December Holiday Dinner program was held on Tuesday, December 20. Thanks to Jan Bookwalter, Tammy Small, and Laura Pratt for coordinating this program, and to all the amazing folks who donated the items needed to complete 10 total dinners (plus extra stuff) for local families. The sign-ups for the food took place on Sign-up Genius. Thanks again for all your support! Contact us at holidaydinner@tecare.org with any questions. 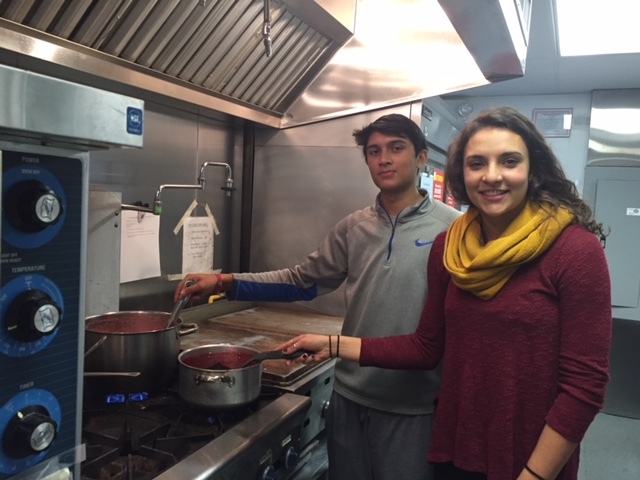 Again this year we cooked dinner at St. Luke Lutheran Church in Devon to help provide dinners for ten local families. This took place on Wednesday, November 25, with delivery later that day. 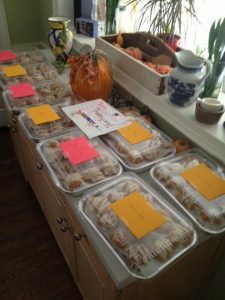 We provided the basic Thanksgiving foods, plus some extra treats to each of these local families. MANY special thanks to St. Luke for opening its doors again to us this year. What an amazing partnership. And much appreciation to Cindy Gilroy and Danyll Lockett for organizing this important event, and to Laura Pratt for helping to line up the families receiving the support. 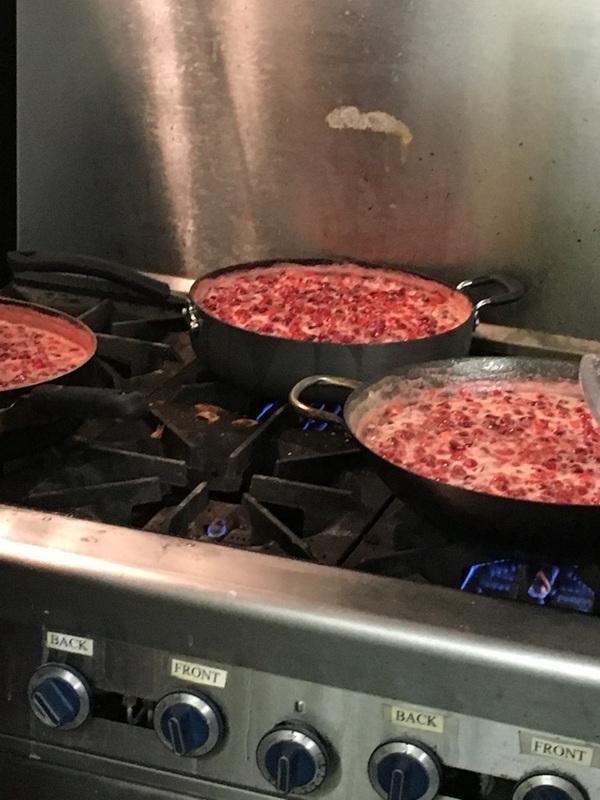 And to all those who donated food and/or cooked – WOW you are the best! The Amana Foundation will again provide much of the fresh vegetables. The Lockett kids are making banana bread for each family. As with Thanksgiving, we identified 11 local families who could really use some extra help with the special holiday meals. 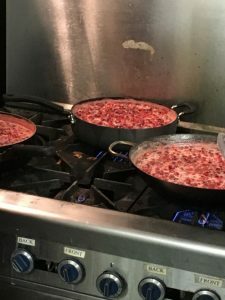 We don’t cook for this event – we just gather the items needed and deliver them to the families. Tammy Small and Jan Bookwalter coordinated this event, and Laura Pratt helped with the family connections. The collections/deliveries took place on Monday, December 21. The food sign-up list was found at http://www.signupgenius.com/go/10C0D4FA5AF28A1FB6-december/23709553 for future referene. Special thanks as always to the Amana Foundation for again providing much of the fresh vegetables. 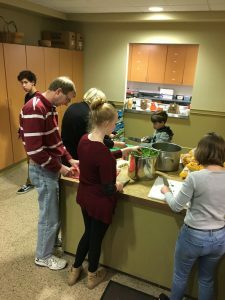 Thanks to the folks at St. Luke Lutheran Church in Devon for agreeing to host our special Thanksgiving cooking event on Wednesday, November 26. The snow that morning added some interest to the event, but in the end nine local families were offered support through this program. Thanks to Cindy Gilroy and Danyll Lockett for coordinating this event, and to Laura Pratt for helping to assign the families getting support. 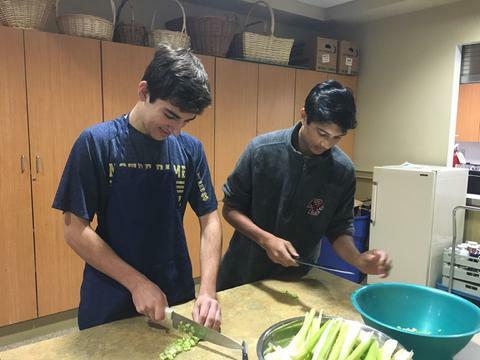 Thanks to all those who helped cook, donate food, and deliver the food. 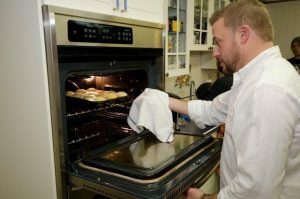 Special thanks again to the Hayden family for baking eight pies, and to the kids in the Amana Foundation for donating bags and bags and bags of fresh produce for all of the families. We have included a great picture of this incredible group of kids below. What a great team effort! 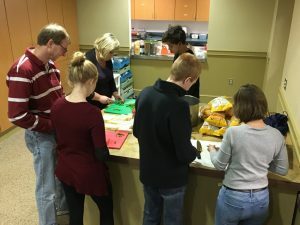 Once again we collected and sorted food for eight local families so they had some great food for their holiday dinners. 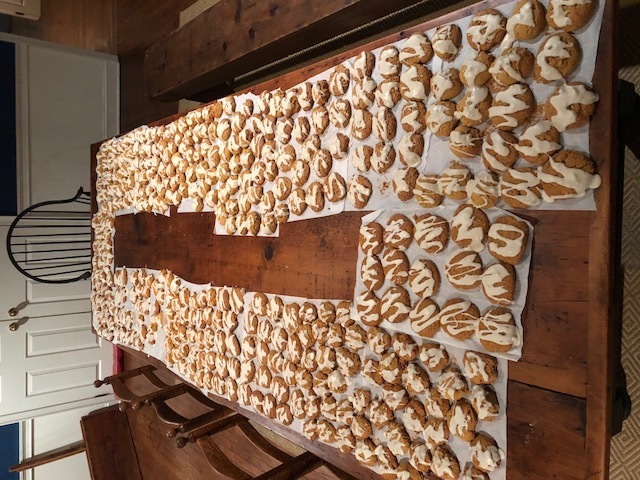 We collected and sorted on Monday, December 22, and delivered later that day. 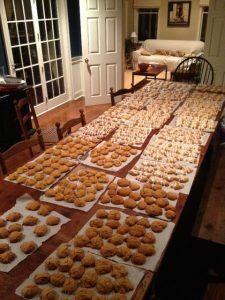 We provided the basic holiday foods, plus lots of extra treats to each family. Thanks to Melanie Bradish and Tammy Small for coordinating this event, and to Laura Pratt for helping to assign the families getting support. Special thanks also to the Amana Foundation for once again providing bags of fresh produce for each family, to the students in Mrs. Lund’s class at Valley Forge Elementary School for providing a bag of toiletries and cleaning supplies to each family, to the Hillside Elementary 3rd grade Girl Scout troop #42060 for providing breakfast treat bags for each family, and a scout troop that offered fresh wreaths to each family. And of course thanks to all those who donated food items and to those who delivered the food. 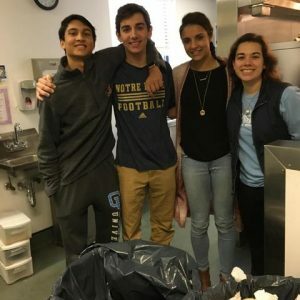 It’s another amazing community effort. 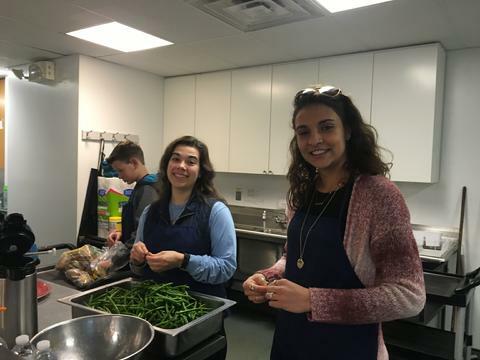 Each year T&E Care volunteers help to provide dinners at both Thanksgiving and Christmas for 8 local families (8 families for each of the holidays). 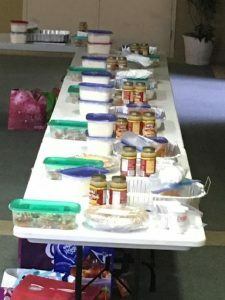 Each family receives the food needed for a complete holiday meal, plus a few extra bags of fresh produce, basic staples, and other special goodies. We thank those who offer to help each year to make this special event happen! 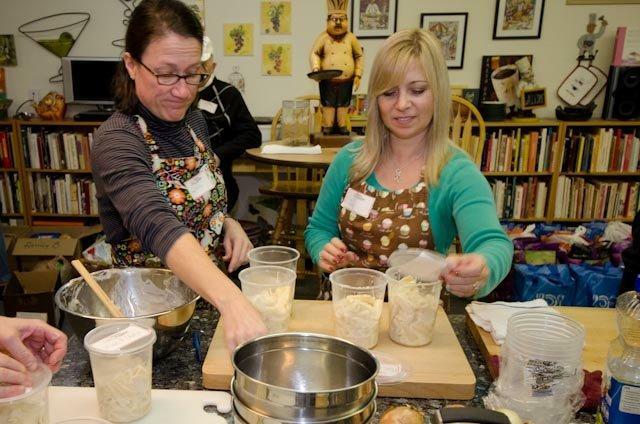 Dinner was cooked on Wednesday, November 27 at The Kitchen Workshop in Paoli, from 10-1. Thanks Art for sharing his facility with us again this year! We ended up supporting 9 families this year! Thanks to the Amana Foundation for providing 8 bags of fresh produce for these dinners, and to the Hayden Family for baking 8 pies! 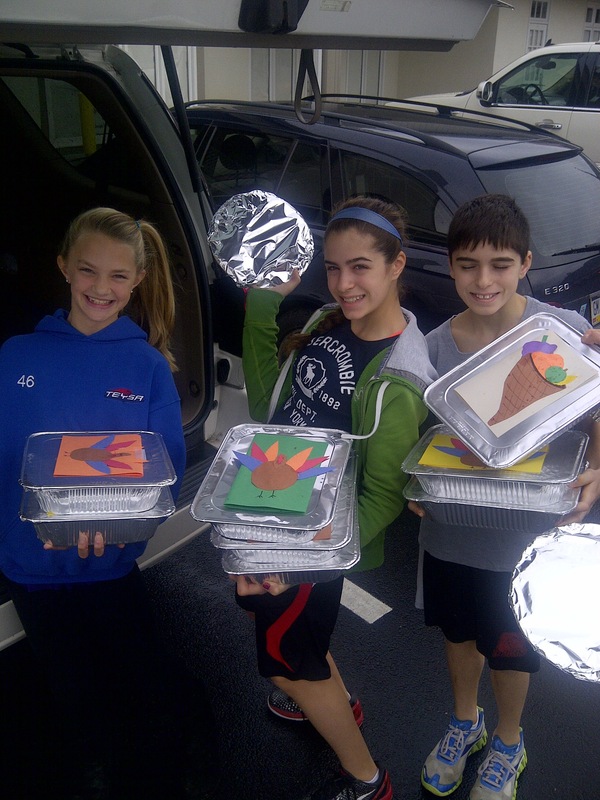 Thanks to the many others who provided turkeys, and/or bags of staples and other special treats. Thanks to Cindy Gilroy for organizing this event, and to all those who gave up time at a busy time of year to help with the cooking and delivering of food; and to Laura Pratt for organizing the specific family needs. A lovely older woman came with her grown son to pick up their family meal. As we carried their bags to the car, she shared her current struggles in the midst of a very difficult divorce. “He’s taking everything I had; I don’t even own the clothes on my back”, she said. But she has her kids and today, thanks to you, they are sharing a beautiful Thanksgiving meal. For this one day, her life is okay because you gave an hour or a turkey or a bag of food or a pie. For more amazing thank you notes – go to our Wall of Care page! 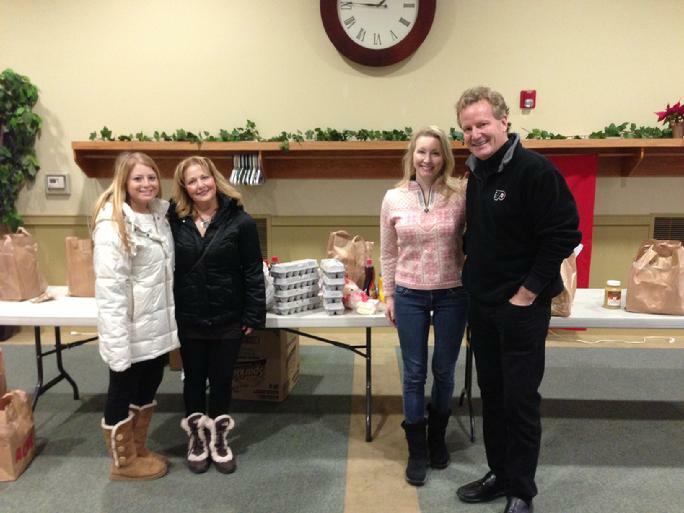 Food was collected on December 20 and distributed that same day to 10 local families. 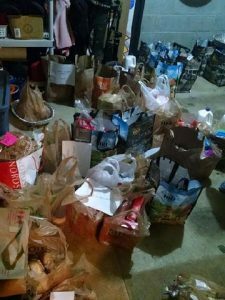 We expected to just help 8 families, but so much food was donated we had enough for 2 additional families. Special thanks to Melanie Branish and Tammy Small for jumping in and running this event extremely efficiently! A huge thank you as well to Laura Pratt for organizing the families receiving the support. 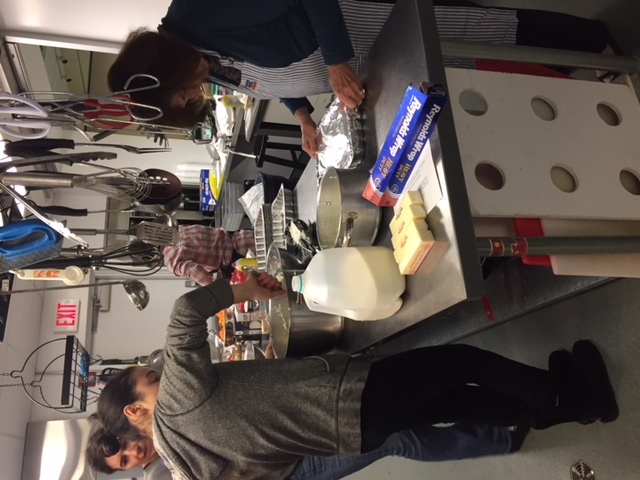 Thanks to all those who made donations of hams/turkeys, special food for the dinner itself, extra food to help fill the cupboards, extra veggetables and fruits, and special home-made desserts. And to those who helped with the deliveries. We couldn’t have done it without you! 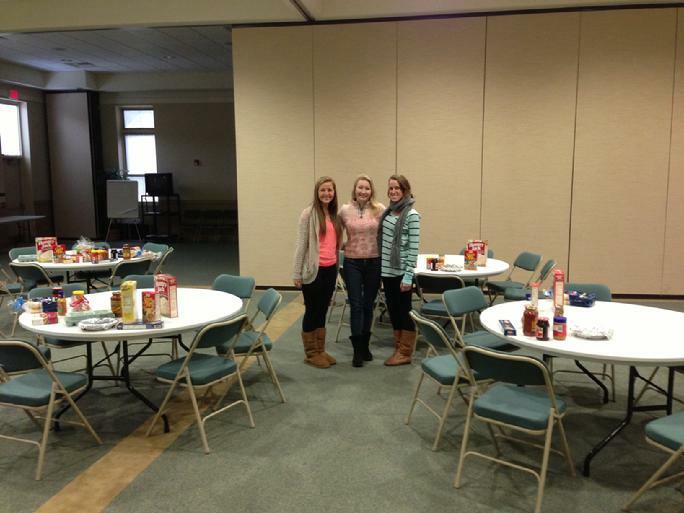 Thanks to the Hillside Daisy Troop #4323 for putting together 8 special breakfasts! Thanks to the Valley Forge Cadette Troop #479 for putting together 4 extra bags of food. 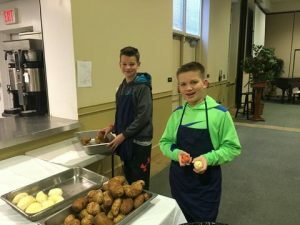 Thanks once again to the Amana Foundation for providing many many bags of fresh produce for these dinners (as well as for the Thanksgiving dinners)! Questions can be sent to holidaydinner@tecare.org. I just received a wonderful Christmas dinner from your volunteers! That would not have been possible, were it not for the generosity of the good people at T&E Care. Thank you for all you have done and are doing in the community. Your generosity has made a profound difference to many families on the Main Line, particularly, my family. In short, thank you for helping my family during the holiday season! Last Friday, I picked up the generous holiday donation of healthy and fresh food that was so kindly donated to my daughter and I. The amount of fresh and nutritious food was more than plentiful. In the true holiday spirit, I decided to invite my two elderly neighbors who had no one to spend the holidays with over for holiday brunch (thanks to all the breakfast goodies) and dinner. 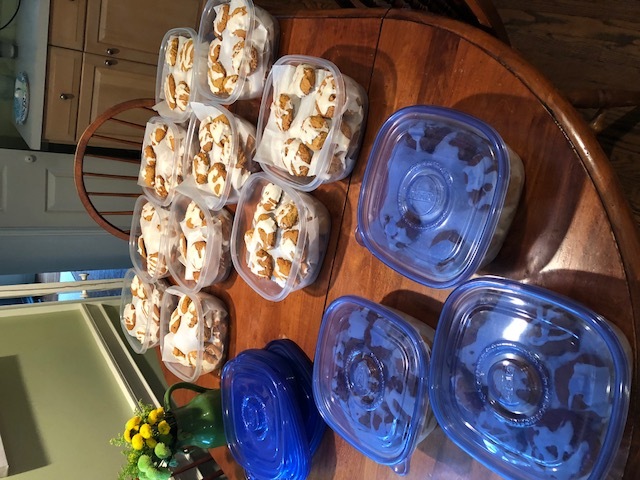 With the leftovers, I was able to make dinner for several nights for my family as well as my lovely two neighbors. The fresh veggies and fruit were incredibly fresh and such a treat for my daughter and I. Living on a tight budget it is difficult to incorporate fresh veggies and fruit all the time. It is essential our youngsters understand and learn healthy eating habits. My daughter just realized she enjoys cauliflower and zucchini which were provided to us. Again you and TE cares not only made my daughter and my holiday wonderful but my neighbors as well. It was a joyous holiday for all of us! I am so grateful I was able to share your generosity with some others who would not have the company and wonderful meal. Meet Christmas and happy new year. 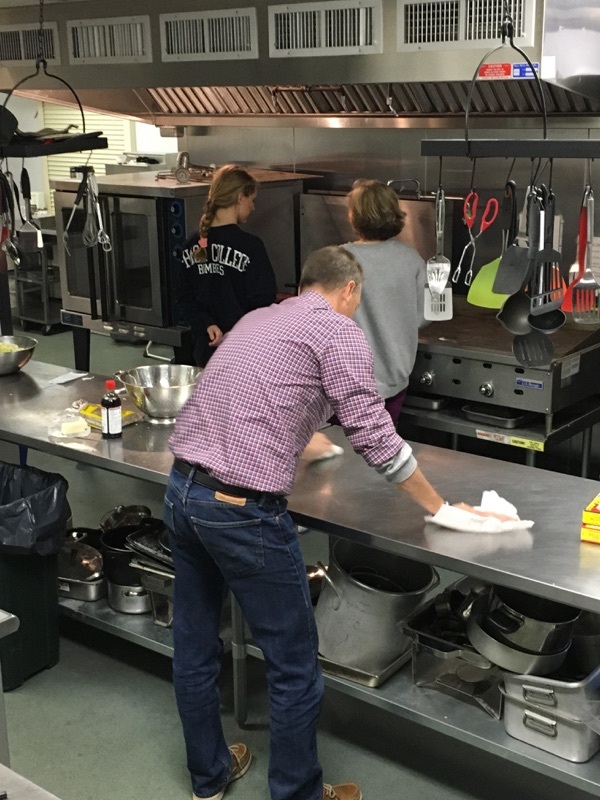 Again this year T&E Care prepared Thanksgiving dinners for local families at The Kitchen Workshop in Paoli. The plan was to help out 8 local families, but due to last minute emergency requests, we ended up giving dinners to 11 local families! 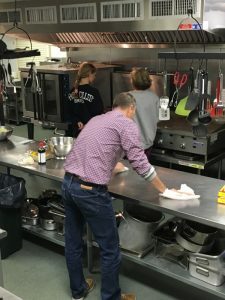 Thanks to Cindy Gilroy and Danyll Lockett for overseeing this special event, and of course our special thanks to Art Roman at the Kitchen Workshop for organizing the cooking. 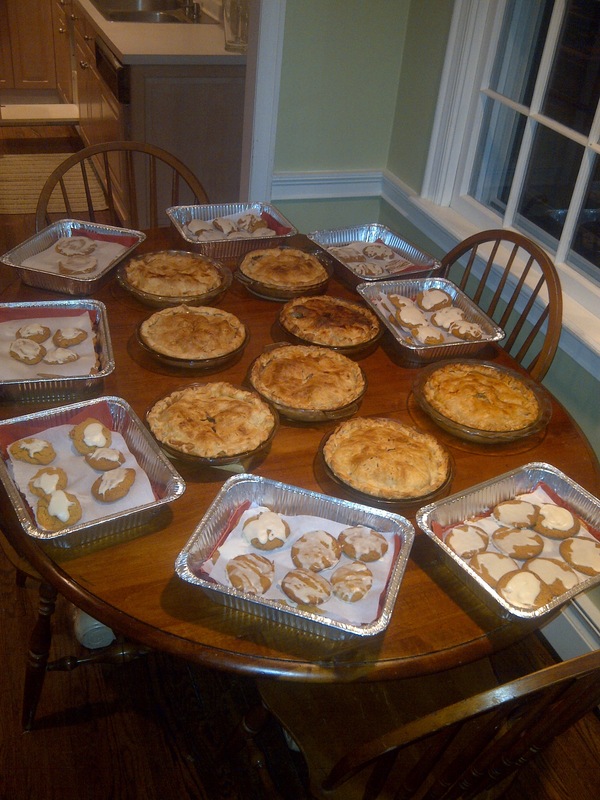 The Hayden family (over 500 cookies and tons of pies!!) and The Amana Foundation (bags of fresh produce for EVERY family) also deserve a huge shout out! 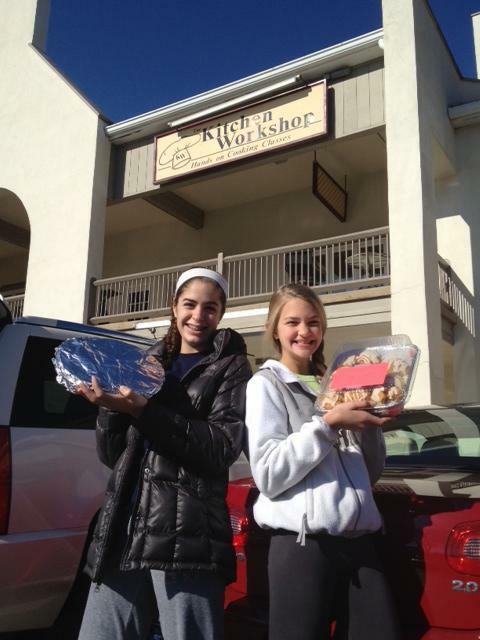 And of course – many thanks to all those who shopped, baked, cooked, sorted, and/or delivered the special meals. Below are some thank you notes from some of the families we supported. It’s clear that this assistance is very much appreciated! I wanted to thank you for a wonderful Thanksgiving. Due to your generosity and help, we were able to provide for our family and extended family this season (7 of us!). Once again, you blew me away. We had tons of food, both prepared and unprepared. On top of that, we had three bags of fresh produce! Being on a extremely tight food budget, it is hard to purchase fresh ingredients for my family. This was a great treat! Thank you TE Cares, Art and all the hands that went into this project! I’d like to show my gratitude for all you have done for my family, in particularly this past Thanksgiving holiday. It was such a pleasant surprise walking in the house and seeing all the food in the doorway! It’s amazing what you guys do for us! Thanks you so much! 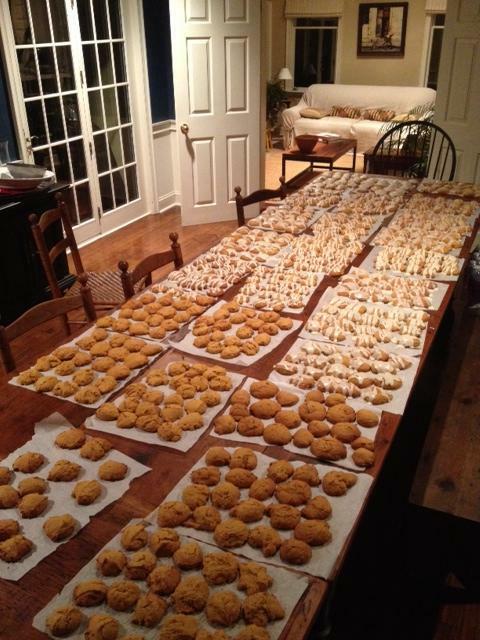 P.s the pumpkin cookies are amazing! I just wanted to take a moment to thank you, the cooking club and the Hayden family for the Thanksgiving dinner and drop off. It was such a wonderful meal- complete with two types of dessert! To still be able to have a turkey with all the trimmings when we probably would have gone without- meant a lot to my family. Since my husband has been working only a few days a week for the last month and money has been very tight- we were especially thankful for this. Questions? Contact us at turkeys@tecare.org. 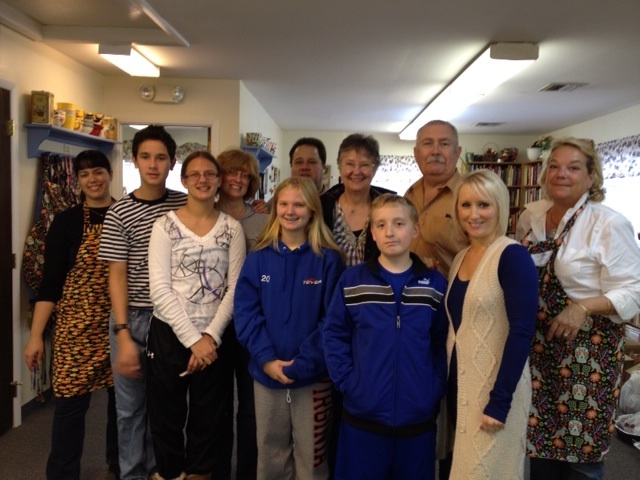 Again this year T&E Care gathered food for 8 local families for holiday dinners. 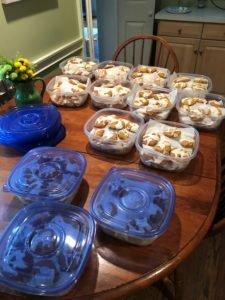 These dinners are not cooked – we just gathered the items that would be good for a dinner or two (with a few extras) around the holidays. 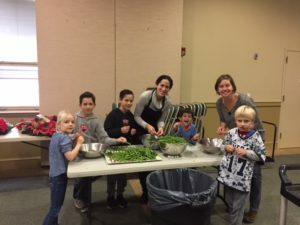 Many many thanks to St. Luke Lutheran Church in Devon for letting us borrow the space to collect and sort the food items. Special thanks to all those who donated food for the dinners and delivered the dinners. Special thanks once again to the students of the Amana Foundation (headed by CHS senior Ibrahim Souadda) that collect bags and bags of fresh produce for EACH of the 8 families we supported. And extra special thanks to Aimee Ducasse and Jim Battista, and their daughters Jen and Erica, for coordinating this effort. They did a great job and we were thrilled to have them on board with our organization. If you have any questions about the event, feel free to contact us at holidaydinner@tecare.org. Below is the summary from Aimee Ducasse related to the results of the event. 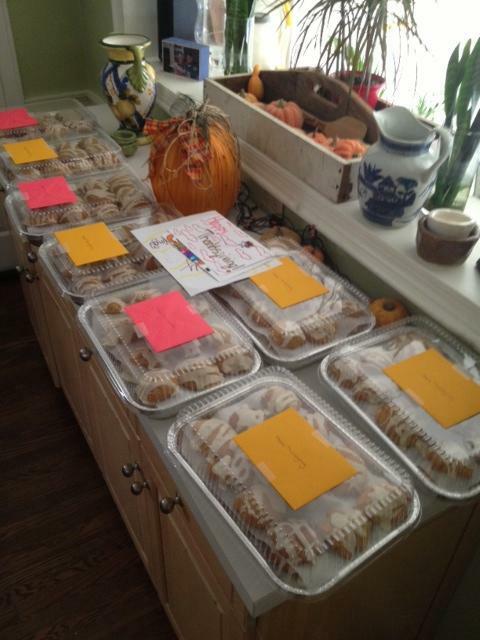 You can see that these 8 families were really given a special treat! A huge thanks to Amana Foundation who donated 3 bags of fresh produce for EACH family. 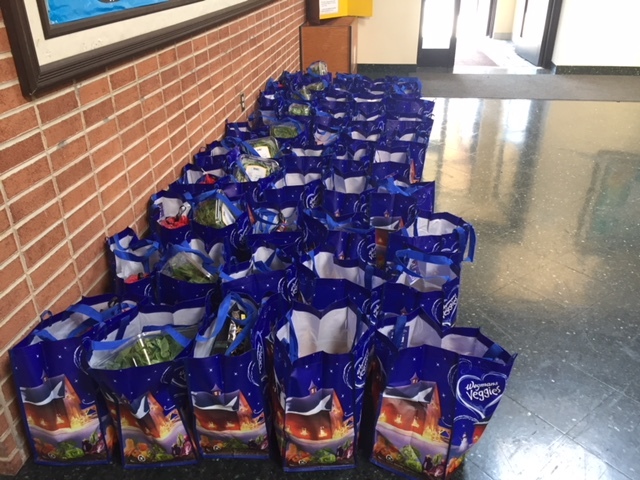 All came packaged in re-usable whole foods bags, included were 2 banana bunches, bags of apples, oranges and pears, 2 packs of carrots, bags of onions, potatoes, sweet potatoes, green beans and zucchini, spinach, two lettuce heads, broccoli, cauliflower and celery for each family. WOW!!! 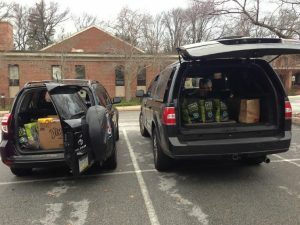 Also, the Sugarman family donated an abundance of groceries and hams for 4 families. We had a total of 9 hams so we gave the largest family 2 hams. 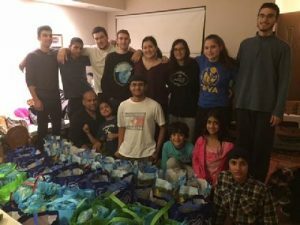 Each family received 4 bags of groceries along with the 3 bags of fresh produce. We had no shortage of desserts and every family received multiple desserts. 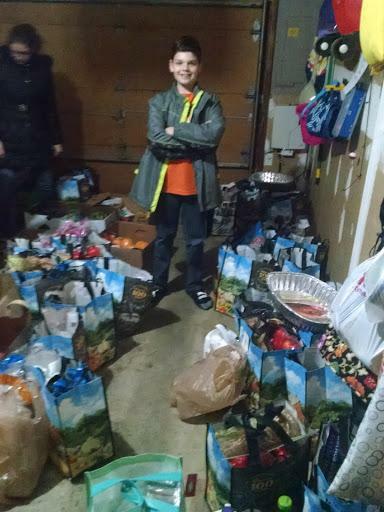 In addition to donating food items, Molly DeSantis donated 2 $50 Wegman’s gift cards. We gave one of these to two of the families. We made that decision because when we called each family to confirm delivery, both of these women cried on the phone. A special thank you to Allen Benner-Smith at St. Luke who made room in the church refrigerator and gave us a great space to work in to collect and organize the donations. He even provided holiday music and wireless access so I could keep the Google document updated. Also, a big thank you to Megan Robinson and her son, Jacob, for donating food and handling the Thursday shift from 4-6 pm at St Luke’s to collect donations. She emailed me a list of all donors and their respective donations which was a big help. 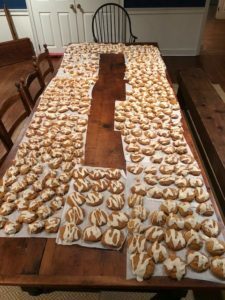 Others to thank include Carol Tompkins, Margot McGinley, Jodi Monster, Tammy Small, Angela Lawton, MaryAnn Kotzer, Pat Ellen Corr, and Elisabeth Sajed. We can’t thank enough all of the people who contributed to making this event a success including everyone involved with T&E Care. Below are a few thanks notes from families we supported. Below that are pictures from the collection day – you can see the volume of items included for each family. To the T/E Cares Community: Just a note to let you know how very grateful we are for all your group has done for our family. Words can not express how thankful we are for your generous support and care for our family. Please know all the things you have helped us with has not gone unnoticed! 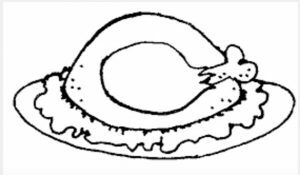 Our hearts are full with thanksgiving. I wanted to say thank you from my children and I for the absolutely delicious Thanksgiving dinner and additional groceries. We are extremely grateful. We hope you had a wonderful Thanksgiving and wish you a very Merry Christmas. We are totally blown away! Thank you to you and EVERY volunteer that made this Thanksgiving so special!!! We were not expecting half of what we received. And the real kicker was that most of Thanksgiving dinner was prepared. Ah, so thankful! 🙂 Additionally, the extra food and goodies were a huge blessing. I lost track when I was able to squeeze fresh produce into our budget. What a special treat. Thank you! Thank you! Thank you! Thank you! OMG! Thanks so much for the dinner. It was so much I was able to share it with a neighbor!! You have been such a great help to my family and I that I cannot thank you with words. Words alone can not express the amazement on our faces when we saw all of that wonderful thanksgiving food that was delivered to us. We truly were shocked at the amount and the love that was put into it. We had a wonderful thanksgiving thanks to you and your group. Thank you so much for your constant care and concern to our family alone! we truly appreciate it! thank you 🙂 I hope you had a nice thanksgiving as well. All my love to you and your group. I wanted to send thanks on behalf of my kids and myself for the most wonderful and generous food gift we received from you , Art, and kind people in our locality. 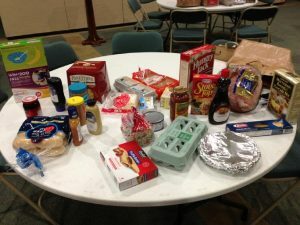 I was grateful not only for the items to make a full Thanksgiving meal but also other items which made many other meals. The children in particular enjoyed the cheese and fruit, and I was so happy to receive extras like butter and coffee. It was a lovely day – we ate, went for a walk and had a nice relaxing time. It helped to take the sting out of the fact we had to give up my daughter’s car the following day. I am also pleased to report that I have, as of today, been able to get a temporary seasonal job for a few weeks at one of the stores at the mall. It does not pay at all well but it is better than no job , while I continue to try and get a position in my skill, and will help keep the wolves from the door. I start with orientation tomorrow morning. Many many thanks to all. We will provided dinners for another 13 families at Christmas time. The first 8 families received their dinners (and lots of extra food) on Dec. 22. The rest got theirs on Christmas Eve. We’ve heard many thankful comments from those who received the food so far. Thanks again to Amy Ard, the Amana Foundation, the folks in the finance department at AMG (Advanced Metallurgical Group) in Wayne, Art Roman (Kitchen Workshop again! ), the Bird family and the Hay family for their special assistance with these dinners! Questions please contact us at holidaydinner@tecare.org. Thanksgiving Dinners 2010 – Thanks for your help! Again this year, in conjunction with The Kitchen Workshop in Paoli, T&E Care volunteers made Thanksgiving dinners for 8 local families. 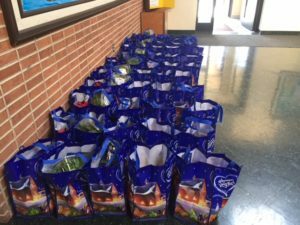 In addition to the normal Thanksgiving foods – we gave each family bags of fresh produce and other fresh foods. 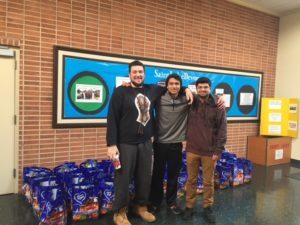 MANY MANY THANKS to all those who donated turkeys, other food items, and most of all …. time!! 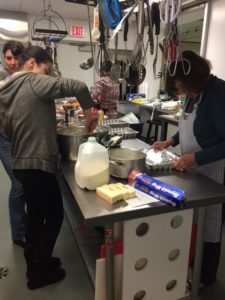 Special appreciation to Cindy Gilroy for organizing the event, to Art Roman (The Kitchen Workshop) for hosting the event, to Johnson Matthey for donating the money to cover the costs of the dinner foods, and to the Amana Foundation for all the extra produce they collected for this event. Thanks to all for helping to make the Thanksgiving holiday a special one for some local families!! First let me thank you and all involved for providing such a bounty of food and produce for Thanksgiving. We all had a lovely meal, and several more. Tis greatly appreciated. I shall send Art (at The Kitchen Workshop) a thank you note for his kindness also. On December 21, 2011 we delivered holiday dinners for 10 local families. The amount of fresh foods that was included in each delivery was staggering. Each family will really have a special meal (and a few other meals!) this holiday season. Many many thanks to those who donated the turkeys and hams, the fresh foods, the holiday pies, and the homemade cookies. 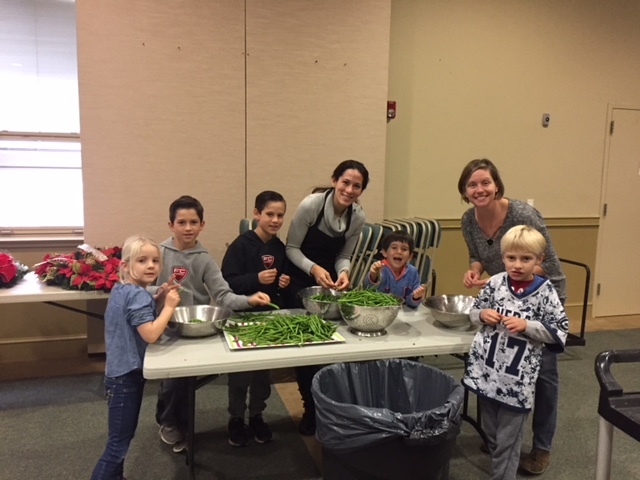 A special shout-out again to the kids from the Amana Foundation, which provided the fresh fruits and vegetables – two huge bags per family (they did the same for the Thanksgiving meals)! 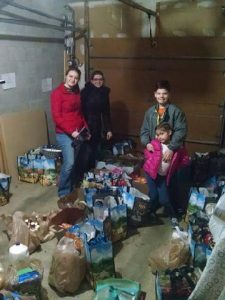 Thanks also to those who took the time to sort and/or deliver the foods to the families. And finally a special thanks to Amy Ard for coordinating the drive, and to the finance department at AMG (Advanced Metallurgical Group) in Wayne for hosting the event. Once again – a team effort for sure – with incredible results!